American Vampire is written well, but the art combination of Rafael Albuquerque on pencils and Dave McCaig on color duty keeps me picking up this issue every month. Albuquerque's style in American Vampire #4 is like a Stuart Immonen style with a little more line work and sketchy feel to it. 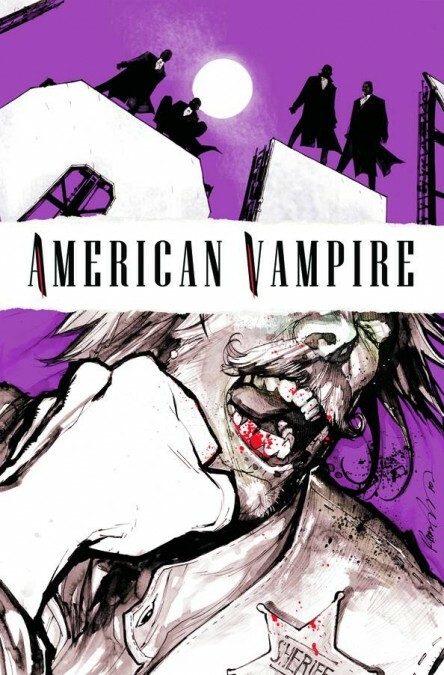 I like the simple yet penciled grit for the old west tale (which Stephen King pens) of evolved Vampires because this era of change in American history was not a polished one...especially in the late 1800's. In the western frontier change was done in the west where ladies' dresses dragged in the dirt and the western winds kicked up into the beards and once-white shirt's of men. In the later 1920's story line of this comic of the day, Dave McCaig really shows his understanding of the story's tone by using very dark tone and shadowy blacks for many of his panels. The darkness represents both death and the mystery of the unknown outcome for our heroine. The dark tones engross the old euro-vamps in a layer of unfamiliarity of something from the past that may soon be forgotten in the shadows thanks to the new and improved American vampires.